I'm sure that surprises nobody. There are still some things to keep an eye on this spring though. Guillen will be one of the Tigers at the center of attention. First, there is the contract issue. He is in the final year of his three year extension and is a potential free agent at the end of the season. He will likely be looking for a lucrative deal spanning 4 or more years. That situation may or may not be resolved this spring but it will be a hot topic which I'll talk more about later. For now, I'll point you towards Mack Avenue Kurt who has the story pretty well covered. Then there are always questions about Guillen's health. Last year, he played more than 140 games for the first time in his career but there were mentions of fluid on his knee a few times during the season and it never seemed completely stable. His knee may have been the cause of his sub-par defense as he often seemed to have trouble getting position to make throws and made numerous throwing errors throughout the season. Whether or not his knee can last another full season probably can't be answered in spring training but we may get some clues as to whether last year's fielding woes were a fluke or whether he'll continue to struggle defensively this year. There is little question about his offense. As usual, first base is a position in question. Sean Casey's first base job seems pretty secure right now but injuries limited him to 112 games and a combined .272/.336/.388 line for Pirates and Tigers last year. Given his age and body type, I would expect more injuries this year. With a need for insurance at first base, Jim Leyland is going to try out Marcus Thames at the position this spring. Thames' ability to handle first base, at least on a part-time basis, would make him a lot more valuable and might determine whether he stays or gets traded at the end of the spring. Another one to watch is Chris Shelton who will be looking to regain his stroke this spring. I get the feeling the Tigers are not too high on Shelton right now but a good spring could put him back in the picture. The other major health question is Gary Sheffield who missed most of last season with a wrist injury. He is supposedly healthy now but he struggled when he returned last year and only regular playing time is going to tell whether he is completely healed. He is obviously, a huge addition to the line-up if he is healthy. The bench will likely consist of catcher Vance Wilson, utilityman Omar Infante, one of Ramon Santiago or Neifi Perez (hopefully not both) and one other player. Right now, the other player looks like Thames, although there is a possibility they may add a left-handed back-up outfielder before the end of spring training. Shelton is another possibility but I think it's likely that he'll start out in Toledo. Another bench question is how well Infante handles center field this spring. He has played out there before but the ability to play it well would give them some extra roster flexibility. Spring is also a time to get excited about young players on the way up. This year, the center of attention among rookies is Cameron Maybin, the most exciting young talent to come through the Tigers system in a couple of decades. 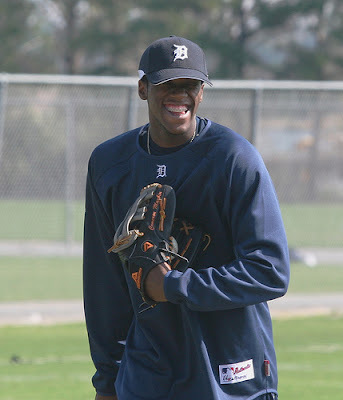 Maybin has virtually no chance to make the Tigers roster but it's going to be fun to watch him run and field and bat against Major League pitchers this March. He'll likely stay in Lakeland in April and team will pitching phenom Andrew Miller. I'm interested enough in both of them that I plan to go down to Lakeland in April to watch a couple of regular season Flying Tigers games.